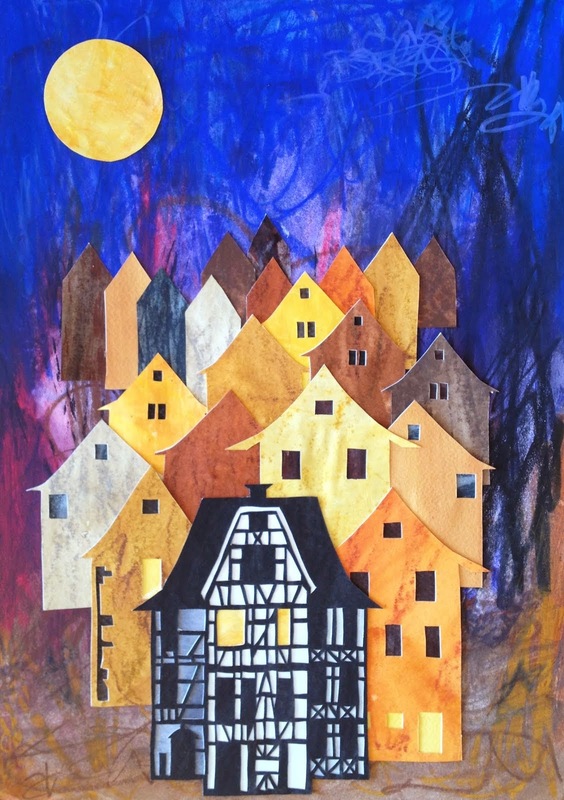 After spending a few days in Denmark, I set off for Iceland, where my friend is studying abroad at Listaháskóli Íslands, an art school in Reykjavik. 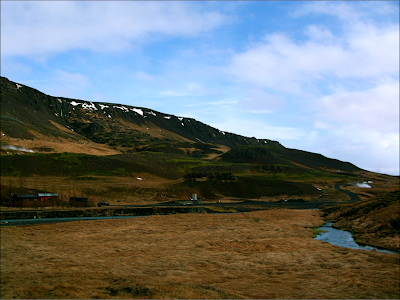 I took a bus ride from the airport to the city across moss-covered lava fields. 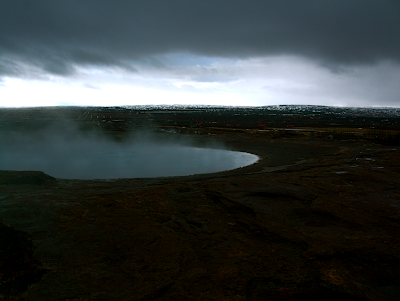 Already, it was clear that Iceland's landscape is other-worldly. 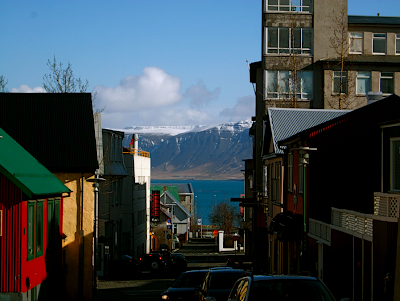 Although it is a small city, Reykjavik is home to about 2/3 of Iceland's 300,000 inhabitants. Below are some of my first views of the area. Although it was an overcast day, Mt. 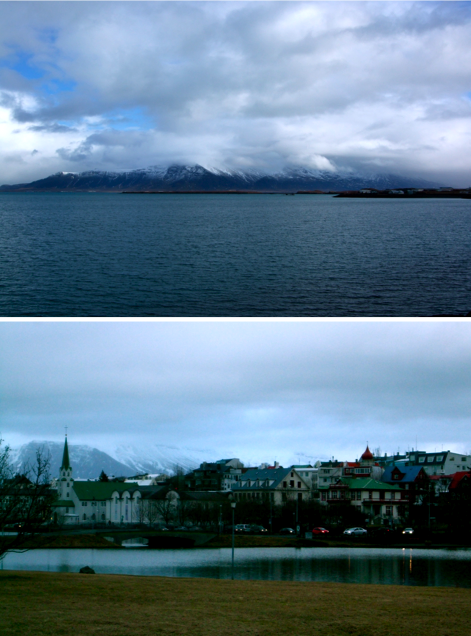 Esja, situated across the water from Reykjavik, can be seen in both pictures. 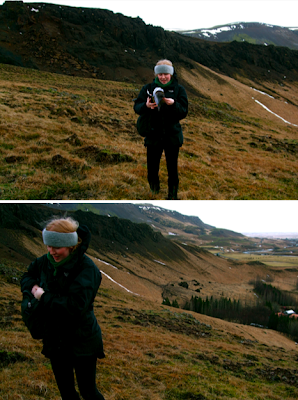 We embarked on an adventure to find and swim in the hot springs near a small town called Hveragerði. As we walked out of town towards the wilderness, Iceland gave us a taste of its fickle weather-- clouds, misting rain, hail, and heavy rain. As they say in Iceland, "if you don't like the weather, just wait 5 minutes". Finally, the clouds gave way to blue sky and a little sunshine. 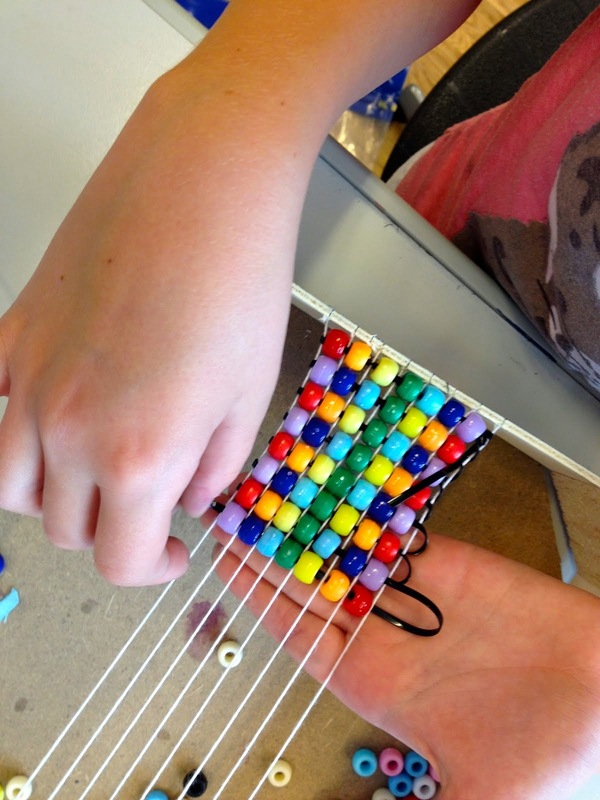 Look at the beautiful colors-- black, green, blue, and tawny brown. We got bored with the road, climbed over some fences, and headed for the hills. Who needs the trail? Or the map? We followed the steam rising in the distance. We came across a piping hot rivulet, green with squishy algae. Soon, the little stream lead to a river. 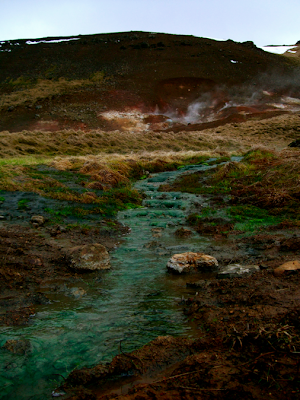 There, we found many more hot springs feeding boiling water into the river. But, due to lots of chilly rain and melting ice, the river was too cold to for swimming. We didn't mind, though, because our ramble had been quite the adventure. Look at how my friend matches the landscape. 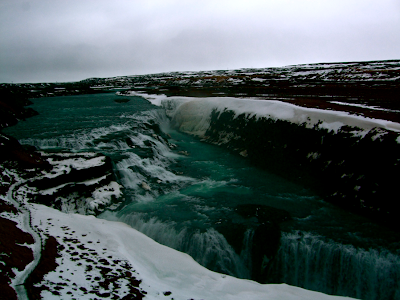 On a day when my friend had class, I went on the Golden Circle Tour to see some of Iceland's famous natural sites. 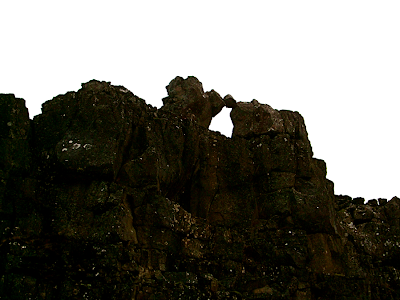 Our first stop was Thingvellir National Park, the site of the first parliament of Iceland. 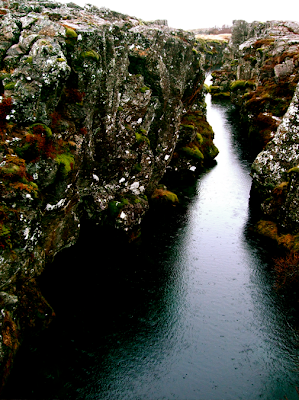 The park is set in a rift valley where the North American and European continental plates meet. 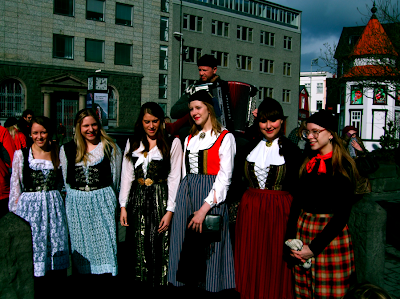 Actually, they are moving apart a little bit every year, so the valley is growing. Here is a picture of the North American continental plate. 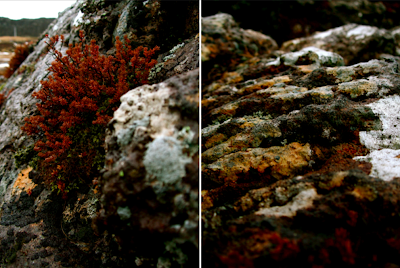 ...and covered with moss, lichen, and little plants. 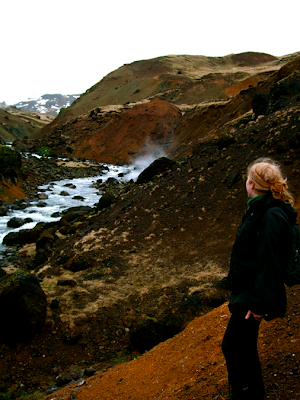 Next, we stopped in Haukadalur Valley, full of boiling geysers. 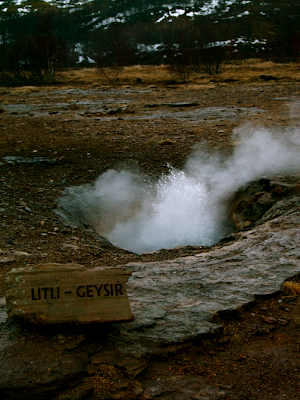 The word "geyser" comes from the name of one of the largest in the area, Geysir. It doesn't erupt anymore, but it still steams. 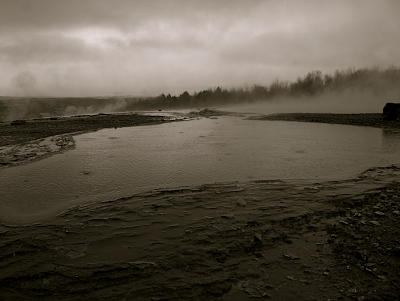 All around, steam rises from the ground, floating up into the grey sky. Some of the geysers were bubbling joyfully, like this one. After watching Strokkur, an active geyser, erupt, we headed to the next sight, Gullfoss waterfall. It was huge, powerful, and icy. 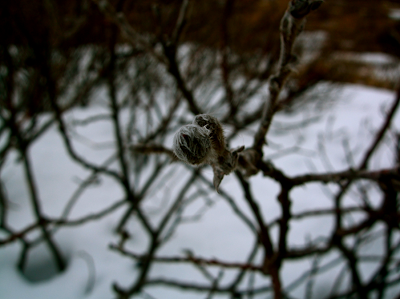 Little bushes poked out of the snow near the waterfall. 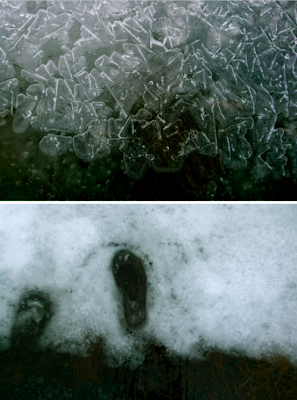 Look at the patterns in the ice. And the footprints. 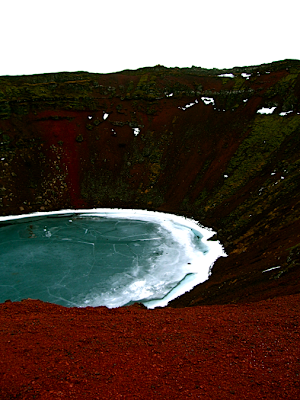 Our last stop was Kerið, an explosion crater. An explosion crater is similar to a volcano, only it has only erupted one time. Look at the colors: blue ice, soil red from iron, and green rocks. 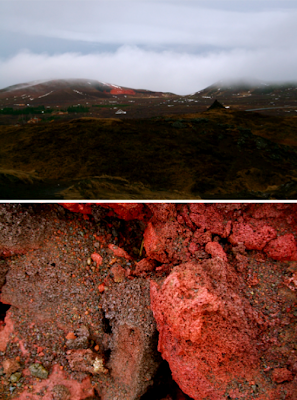 Here are some views from Kerið. On the bottom are some rocks from around the crater. On the top, you can see the barren landscape with an iron ore deposit in the distance. Notice how few trees there are in Iceland. In fact, the only native tree to the island is juniper, which is short and stubby, like a bush. Icelanders have a saying: "If you are lost in an Icelandic forest, just stand up". 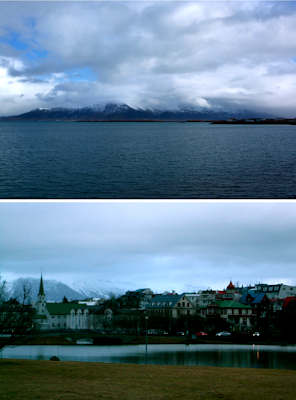 On my last morning in Iceland, my friend and I wandered around Reykjavik. The sun was shining and the sky was clear, so Esja was visible, rising up above the city across the blue water. 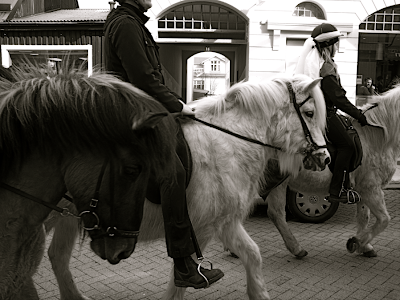 ... and lots of Icelandic horses. Beautiful, just beautiful. I like how you encourage to notice the colors. Its so easy to look at a picture and only see part of it. Oh WOW! I didn't know that Iceland was so awe inspiring. I LOVE this post. It's so beautiful and amazing. Thank you for sharing this. Take care.